After the years of rumors and waiting game, the mid-size Ranger finally returns stateside. However, in the first model year, the Ranger will come in the limited number of configurations at least compared with other truck options in the country. The new Ranger debuts with the single turbo-4 engine and Ford also limited the number of trims to three. The XL, XLT and Lariat will be in the offer while more we should expect for the 2020 model year including also the new engine option possibly the diesel one. However, what also makes the buyers impatient is the decision about the Raptor version for the US market. For the off-road-focused buyers stateside, Ford will offer just the FX4 package while already debuted the Raptor version for the global market. But everybody believes that the US Raptor version is just the matter of time and recently the left-hand-drive version was spotted while testing in the US. The model seems to have the diesel engine under the hood judging by the diesel’s specific clutter. The US Raptor should, however, get the turbocharged petrol power per expectations but the diesel would also be great as the rival for the 2.8-liter turbodiesel in the GM’s mid-size trucks. What is expected about the US-spec version, the model could debut as the 2020 Ford Ranger Raptor. It will share heavily with the global version in terms of the design and underpinning as it is the case with the conventional versions. 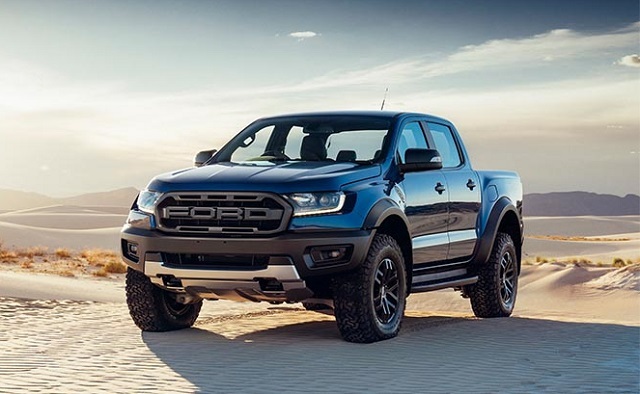 While we don’t have doubt that 2020 Ford Ranger Raptor for the US market will be almost identical to the global version in terms of the style and structurally, the engine version Ford would pick is the million-dollar question. The prevailing opinion is that Ford will go with the EcoBoost four- or six-cylinder petrol unit. The solution could be a 2.3-liter turbo-4 EcoBoost with the power around 310 hp and torque 350 lb-ft. This unit produces these numbers in the Mustang. Ford might also pick a 2.7-liter EcoBoost V-6 from the Ford Edge and fit it for the Raptor. In the current form, this engine makes 335 hp and torque of 380 lb-ft.
For the global market, Ford introduced, however, a unique 2.0-liter twin-turbo four-cylinder turbodiesel engine. This oil burner pumps 210 hp and torque of 369 lb-ft. It would nice Ford to fit this engine for US standards and offer the alternative for the 2.8-liter turbodiesel I-4 form the Chevy Colorado. On the other hand, the Raptor will come with the wider track and long-travel suspension. The suspension setup will be similar to the setup of the successful F-150 Raptor. The model will also get the underbody protection and all-terrain tires. The capable all-wheel-drive system and special Terrain management System will also boost the off-road performance of the mid-size Raptor. In terms of the styling, there won’t be notable differences between the global version and the 2020 Ford Ranger Raptor for US market. The truck will arrive with the Raptor-specific, dark grille and more muscular bumpers. The higher ground clearance and suspension travel will also provide a safe approach and departure angles on the rugged terrains and have the visual impact on the model as well. The wider and protected fender flares and large, all-terrain tires will also form more muscular look. Inside the cabin, the Ford Raptor will arrive with the unique upholstery and logos. The sports steering wheel with the shift paddles will also make the difference. The buyers will also get Ford performance seats. On the tech side, the Raptor won’t lack the modern equipment. The truck will come equipped with the new Sync 3 infotainment system, probably with 8-inch touchscreen. There will also be the navigation, strong sound system, voice activation and more. The safety of the passengers will also be in the focus. The model will integrate systems like the Descant Control and Hill Start Assist, rearview camera, etc. There will also be some advanced systems including Lane Departure warning, Rollover Mitigation, etc. 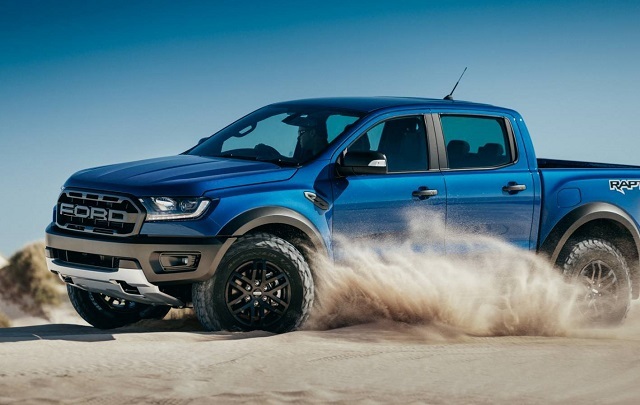 The 2020 Ford Ranger Raptor is expected sometime in 2019 although some sources claim the arrival for the 2021 model year. The model could also debut in early 2019. As for the price, the first estimation is that model would cost in high-30, 000 American dollars. For example, in Australia, the model has a high price tag of 74, 990 Australian dollars. 2018 Ford F-450 still keeps its dominance!